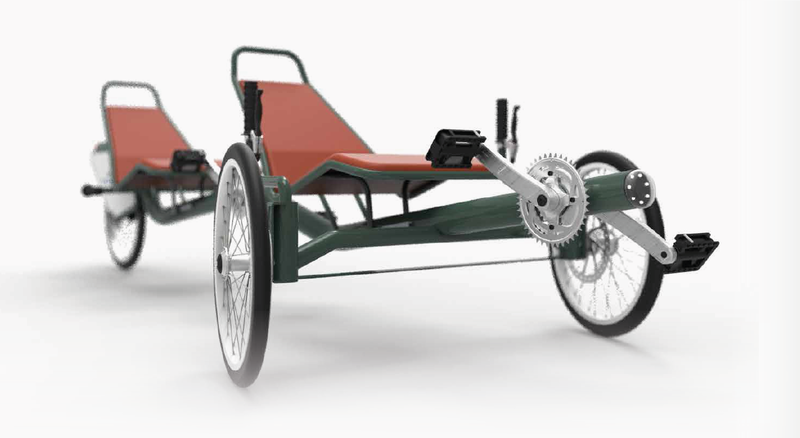 Triiki has got two front wheels with brake, bells for the front and rear user , it has also got two white lights on both front wheels, front and rear reflector. Refractors on the wheels do comply with traffic regulations. The chain transmission in the plates section is protected for maximum user safety. The wheels have been protected with mud guards for added safety and cleanliness. According to Evaluation report No. 15/32300223 conducted by LGAI Technological Center, SA, TRIIKI tricycle model meets the criteria of Directive 2001/95 / EC relating to the General Product Safety. The basic model 58.5 kg. The full model with accessories and seats (2 units) plus saddlebags, weights 75 kg. The chassis and the metallic elements used are made of high quality steel pipe to ensure a stable and reliable assembly behavior. The finishing coating is with epoxy primer + high quality acrylic enamel (painted in oven-cabin) which ensures a coating that protects it from atmospheric agents. 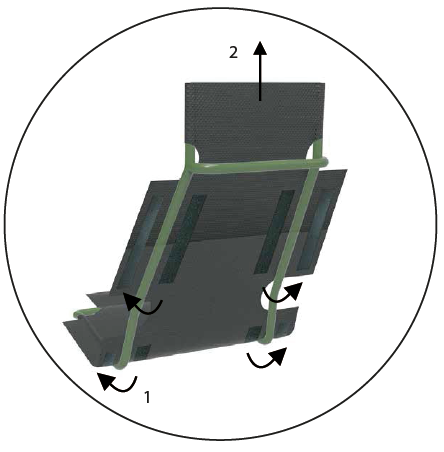 The remaining elements are standard providig the highest quality and safety as specified by the manufacturer. Triiki is designed to carry two adults not exceeding 100 kg each. 10 Kg in saddlebags with objects and food needed to ensure the safety of the activity. Two children between 9 months and 4/5 years and less than 22 kg. Totaling a maximum of 44 Kg. Thus the maximum load that Triiki can withstand is unaltered is 254 kg. Ensure that the chain is maintained properly lubricated. The manufacturer offers 2 year warranty on the product for reasons of proven defects in the manufacturing process, defects or problems by improper use or wear of the product itself are not included. Triiki is a tricycle to be enjoyed on paved streets, green lanes and good condition roads..Capacity for two adults and two children (with accessories) meant to be use d for recreational or transportation purposes. Triiki is a tricycle to be enjoyed on paved streets, green lanes and good condition roads..
Capacity for two adults and two children (with accessories) meant to be use d for recreational or transportation purposes. We recommend you read the manual thoroughly before you start using it in order to assure you a safe, comfortable and enjoyable experience. It has been designed and manufactured under sustainable and environmental criteria, looking for the highest quality and the best user experience. 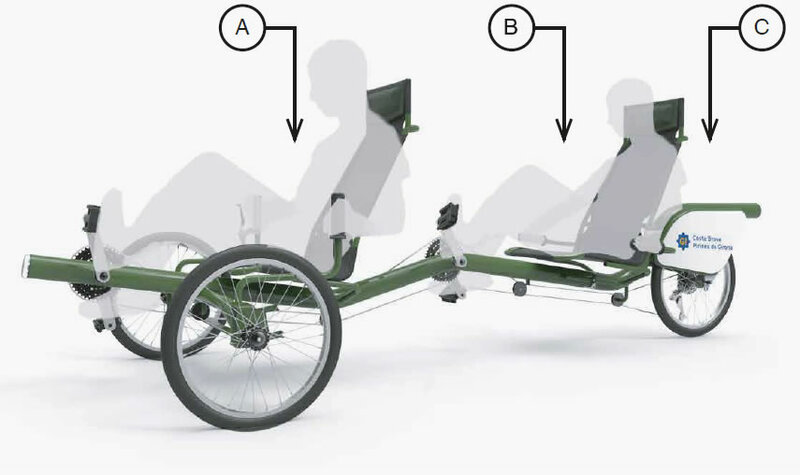 The basic model (see image), has two places for adults (A and B) and one child (C), easily adjustable to ensure the comfort and safety while performing sport. 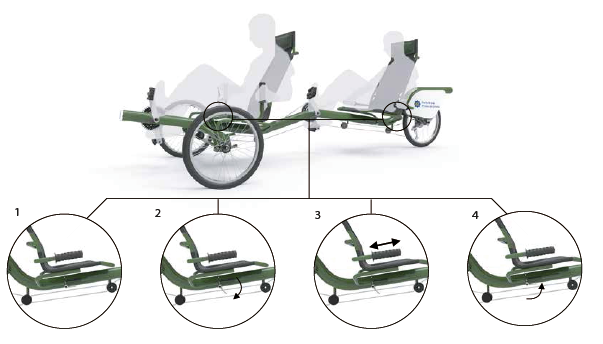 The basic model (see image), has two places for adults (A and B) and one child (C), easily adjustable to ensure the comfort and safety while performing sport. 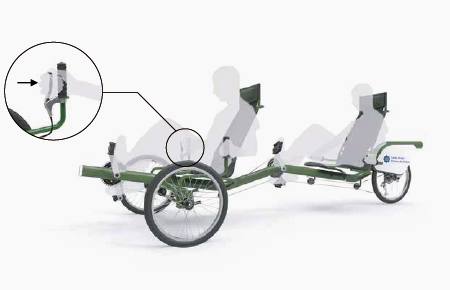 Possibility of coupling a accessory to transport two children (C). The accessory is ready to incorporate a standard baby seat carrier (complying with the ISO11243 standard, 3 adjustable points seatbelt , ergonomic, adjustable footrest and reflective sticker) adult .The position A is for the adult person acting as a driver, as it is the one who has access to the levers that act as steering wheel in the front steered wheels . In these same levers, specifically on the right side, it is the brake lever acting on the same front wheels as it is the user who has a greater forward visibility and can react faster activating the brake. Once you have adjusted your seat, as we will show in subsequent points of the manual, you will be sitting in a comfortable position for driving the front pedals that work in simultaneously with the rear ones. The adult position B, in addition to driving the rear pedals can rest your hands on the two fixed handles available. In his right handle he has the gearshift actuator, which selects among different sprockets of internal change of the rear wheel in order to choose the most suitable to the motion that is been held at the moment. 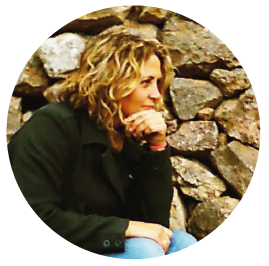 The seats have been designed to offer a comfortable and studied structure that reinforces the natural curvature of the back in order to use Triiki for long and continuous periods. They are lined with a completely breathable and removable fabric making it easy for handling, maintenance and cleaning. To find the most comfortable position that allows us to be use Triiki continuously..
To find the most comfortable position that allows us to be use Triiki continuously for long periods of time, while achieving maximum efficiency in pedaling, it is very important that the first thing made by users when using a Triiki is to adjust seats properly. It is important that the leg in its farthest position when pedaling is practically entirely stretched. To adjust the seat position you should follow the sequenced steps indicated below, considering that is exactly equal to either adult places. Move the seat until the farthest pedaling is almost entirely stretched. Steering is activated by moving the two handles that rotate integrally with .. 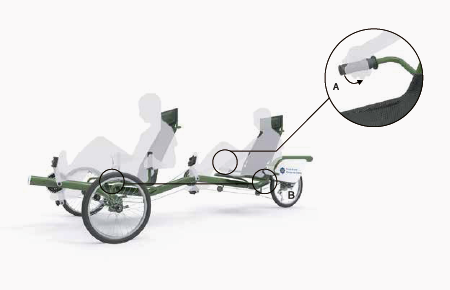 Steering is activated by moving the two handles that rotate integrally with each other in the opposite direction to which we want turn the tricycle. Meaning this , to turn left (A) you must move handles to the right (B), and turn right (C) must turn the handles towards left (D). 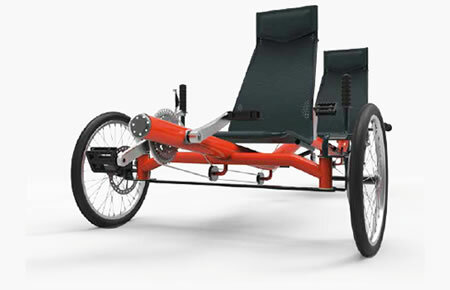 It is a simple, intuitive mechanism and makes it fun and easy to steer the tricycle to the direction we desire to ride. The brake lever is located on the right steering handle and acting on it, we activates the .. The brake lever is located on the right steering handle and acting on it, we activates the brakes of the front wheels (both), which have a very efficient and easy maintenance drum system. From the back seat right lever you can shift gears by turning the clamping handle (A). 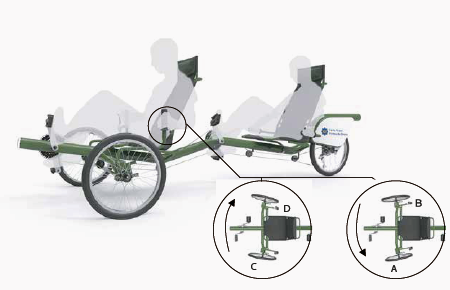 From the back seat right lever you can shift gears by turning the clamping handle (A) .This actuator activates the internal tricycle gear (located on the rear hub, B) allowing you to select among the different gearwheels to find the right gear .We advise you that while the gear shift occurs both occupants stop pedaling, thus facilitating a faster change. The brake lever is located on the right steering handle and acting on it activates the brakes.. The brake lever is located on the right steering handle and acting on it activates the brakes of the front wheels (both), which have a very efficient and easy maintenance drum system .